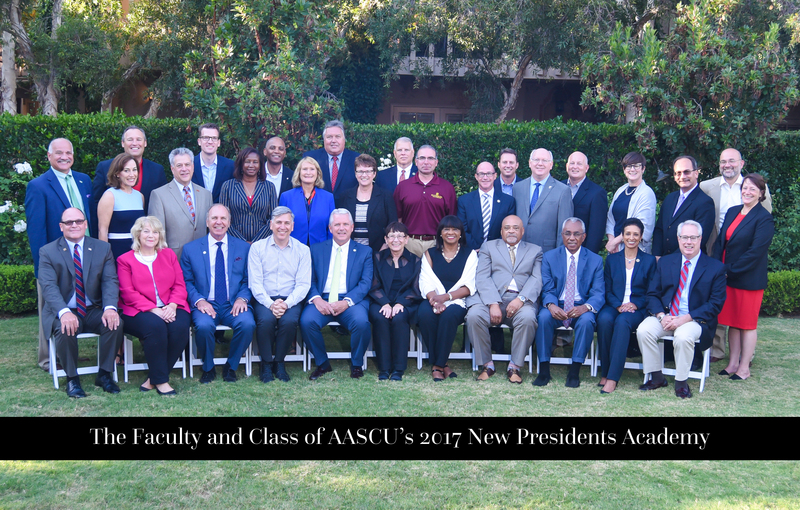 The AASCU New Presidents Academy is tailored to the distinctive needs of presidents and chancellors who lead state colleges and universities. Don't miss this unique opportunity to meet with your state university peers in a learning environment that is supportive, engaging and tailored to the specific challenges that a first-time president is likely to face. The program provides practical advice grounded in leadership research and complemented by the knowledge and experience of current and former AASCU presidents who serve as Academy faculty. The New Presidents Academy is an intensive leadership development experience that begins with an orientation program and dinner on the first evening; includes four full day sessions with group meals; and ends with a closing dinner and transition ceremony on the final evening. Participants are expected to attend all sessions, including group meals. Members of the Academy faculty are engaged with participants throughout the week in both the formal and informal settings. The schedule includes time each afternoon for individual consultations with faculty by appointment. AASCU's New Presidents Academy is the only program that offers new presidents executive coaching and mentoring throughout the first year to support continued learning and success. The academy is open to first-time AASCU member presidents and chancellors appointed after September 2016. Testimonials - What Presidents are Saying.. The New Presidents’ Institute was very valuable. I enjoyed the opportunity to dialog with colleagues in the field and hear about their challenges and assets. It really helped me to put my own challenges and assets into perspective. I appreciated both the breadth and the depth of the information and believe that it has prepared me to move forward with confidence. The resources provided through interactions, presentations, and the binder made this a comprehensive experience. I was very appreciative of the array of topics that were covered, and the opportunity to learn from the examples, experiences and the advice of more seasoned presidents. The ability to connect with a cohort of new presidents is sure to be invaluable as we tackle the very important work that impacts the lives of our students and makes a difference for our communities. AASCU's commitment to our success was further demonstrated by the energy and work that the faculty put into their sessions with us. I am grateful to have been able to participate in this program at the start of my second year. The new President Academy provided an exceptional opportunity to analyze the complexities of the presidency and to be best prepared to lead an institution. I am confident that countless ideas and strategies we discussed will be very instrumental for many years. The New Presidents Academy begins at 4:30 p.m. with the opening general session on Monday, July 30 and ends at the closing dinner on the evening of Friday, August 3. Participants are expected to participate in all sessions and attend all group meals. Detailed schedule will be mailed upon registration. Faculty will be available for individual consultations following sessions at the end of each day. The registration fee of $3,500 includes academy program costs, materials and most meals during the four and a half day program. Participants are responsible for paying their own travel and hotel costs. The Kona Kai is San Diego's premiere waterfront resort destination for travelers from around the world. All the amenities you expect of a luxury resort and more. The Kona Kai hotel near San Diego is located at the tip of Shelter Island. It’s only minutes from the buzz of Downtown San Diego and San Diego’s International Airport. It’s centrally located and easy to reach from major freeways. When calling Kona Kai, mention that you are with the American Association of State Colleges and Universities (AASCU’s New Presidents Academy) to be assured of the $259 group rate per night plus 10.695% Occupancy and 2.00% City taxes. To obtain this rate, please book your room by Monday, July 2, 2018. Reservations should be made before Monday, July 2 to be assured of AASCU’s group rate. Room reservations after that date will be on a space-available basis and may be at a higher rate. Guests fly into the San Diego International Airport, Lindbergh Field (SAN) only 10 minutes to the Kona Kai Resort & Spa. From 1-5 South, take 1-8 to Rosecrans Rt. 209. Continue straight for 3 miles, and turn left on Shelter Island Drive. Follow the road as it bends to the right to the main entrance of the Kona Kai Resort and Spa on the right. Turn right on North Harbor Drive to Scott Street, and turn left Turn left on Shelter Island Drive, and follow as the road bends to the right to the main entrance of the Kona Kai Resort and Spa on the right. Many companies provide taxicab service at San Diego International Airport. Follow the signs leading to the Transportation Plazas. Cancelations received before 5 p.m. EST, Friday, June 29, 2018 will receive a full refund. Cancelations received after June 29 and before July 6 are subject to a cancelation fee of $300. Cancelations after July 6 and no-shows are not eligible for refunds. Refunds are processed and issued within 45 days of the meeting's conclusion.